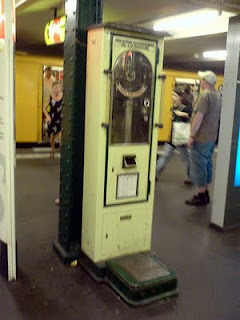 I was in Berlin last week and I noticed these vintage weighing machines on the platforms of a couple of U-Bahn stations, the older ones, I'm guessing. You put ten cents in and it spits something out, possibly a card with your weight on it, I don't know I didn't have the right change. There's a height and weight table attached to the front, a height measuring scale on the side, complete with hook where you presumably hang your coat. I don't know how many of these scales are out on the platforms of Berlin's underground, or if they exist in other parts of Germany or German-speaking Europe. They're quite unobtrusive, but once I saw one I started noticing them elsewhere. Going away highlights the strangeness of everyday life. I've seen weighing scales in public places in the UK too but have never paid much attention to them until now. It makes me wonder why one might need to be weighed on the platform of a train station, or any public place, and also why would one need to be weighed in general. 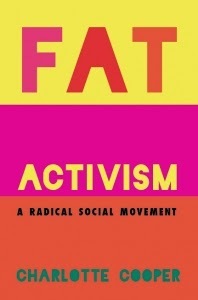 Their presence and incongruity smack of body surveillance culture and the idea that we can never forget that how much we weigh is really important. It reminds me of an experience I had in San Francisco last month (yes, I've been around a bit). There was another set of weighing scales outside a South American convenience store in the Mission. It was shaped like a rocket ship. For 25¢ it tells you how much you weigh on Earth, the Moon (something like 15% of your earth weight) and Mars (approximately half your earth weight). A lo-fi electronic display presents a narrative that includes a countdown and a pretend voyage to the stars, whilst telling you these various weights inbetween. I'm sorry I have no pictures, I was mostly too gob-struck by the whole experience to get my camera out. It was no Yay-Scale, but it was fun and really bizarre. God only knows what this is all about. Re: the SF scale - when I was growing up, I remember there being something similar at the Hayden Planetarium at the American Museum of Natural History in NYC. I don't think it was just one scale, but I remember an exhibit (permanent) of sorts where one would stand on a specified area and get one's weight for any of the planets plus the moon. I remember it being totally fun and cool to learn how much one weighed all over the solar system. Though I didn't think of it this way at the time, it was probably one of the few weight-related things I wasn't embarrassed by while growing up. I saw one recently at a mall in Minnesota near the Food Court. It was in a back hallway by the women's room. Very odd. I haven't seen (or noticed, maybe) these scales in ages. As a teen I had bad weight issues, but regarded train station scales as toys nevertheless. I used to weigh my luggage, for bragging rights. The rocket scale was like a toy, but a weird one. I think I heard somewhere (or made it up) that those sorts of scales come from an era before people had scales in their homes or even were weighed at the doctor's office. Imagine a world where you didn't really know what you weighed, and didn't have any way of finding out. Then these scales appear, and they would be a curiosity more than anything else since it doesn't really matter how much you weigh. Mind you, I guess you would still know your measurements, but still, it's interesting to think about. Almost as mind-boggling as the world before average people had mirrors. I'm 20 and live in the US. I remember when you used to see giant scales like that all over the place (though they were a bit less pretty looking than the one in the picture), especially in grocery stores. I'm not sure what they were for or where they have gone. Haven't thought about them in ages! There's a similar scale at the Frankfurt am Main (Germany) Hauptwache underground station and I have wondered who would use it and WHY they would use it. IIRC, it's even marked as a "Personenwaage" (lit. 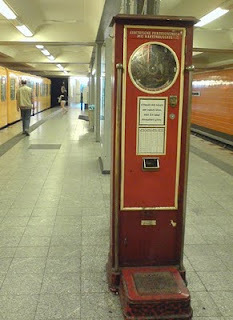 person scale = scale to weigh a person) and not as a "Gepäckwaage" (baggage scale). I want to know more about these scales. I collect ephemera, and somewhere in my stash I have a few tickets from a public weighing machine on the seafront at, if I recall rightly, Blackpool, dated sometime in the 1940s or 50s. The weights are filled in by hand in pencil, and the tickets appear to record increasing weight over the course of a holiday. I've occasionally come across older people who used to gauge the success of a holiday by how much weight you put on during the course of it, so I'm guessing that might have been the rationale behind having weighing machines in this and similar locations. Strange by today's bikini-body standards, though. Eve has it - I do remember reading in several books about both 'what the Victorians were really like' and histories of weight loss (probably 'Rethinking Thin' actually) that knowing what you weighed was indeed first a novelty, like magic lantern shows and Christmas trees. 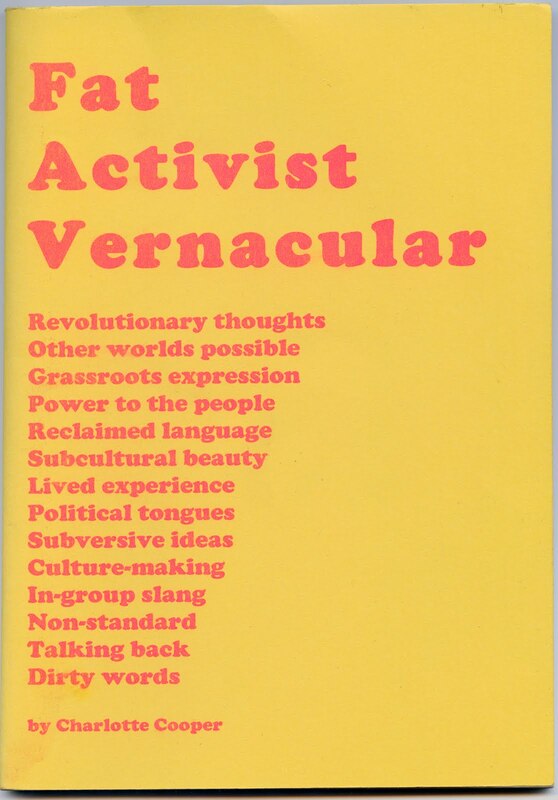 Then, like so many things which started out with good intentions, it became a tool of The Man/body surveillance. I presume things like height/weight tables grew out of Victorian ideas of 'normal' and 'deviant' (which I'm sure you're familiar with) - putting them on the scales meant you could also check how good you were. We have modern, coin operated, scales everywhere all over the city here in Brisbane, Australia. In pharmacies, shopping centres, train stations, convenience stores - they're all over the place. When I was a kid, the Post Office was always the place that had big metal scales that measured your height and weight. That was the only place you ever saw them.